A hot, cheesy appetizer recipe to serve at your big game party layered with all your favorite toppings from the ultimate bacon cheeseburger. 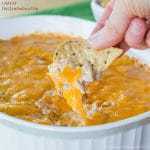 Bacon cheeseburger dip is a hot, cheesy appetizer recipe to serve at your big game party. 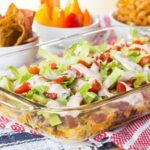 Add even more deliciousness to this game day snack and combine it with the classic seven layer dip recipe. 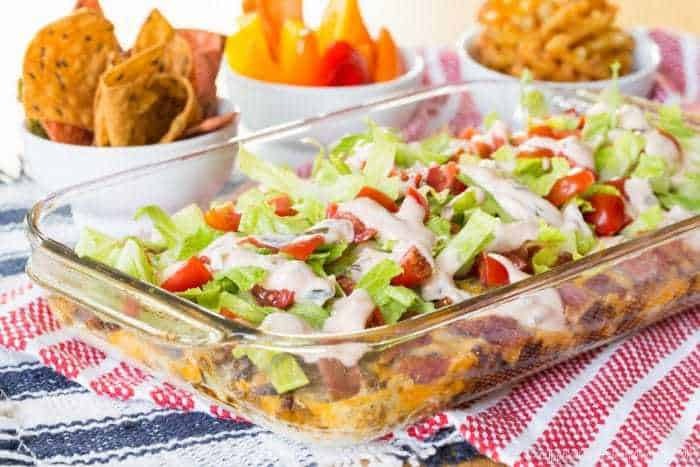 The crowd will be cheering for the food instead of their favorite team when you make this Seven-Layer Bacon Cheeseburger Dip. My boys were totally digging into this recipe. On a random Tuesday. For dinner. I was pretty much winning the Mom MVP Award that night. I mean, the biggest football game of the year was still a couple weeks away. Yet we were devouring a hot cheesy dip for dinner? Let’s just call it practice, or pre-game warmups, or maybe even strength and conditioning. Because we all know the big game is really all about the big game grub. We want to have our game faces and snack bellies ready! OK, really I was just doing everything in my power to maintain my Mom MVP status that week. A mini-marathon of our favorite sitcom to watch together, ice cream for dessert, a trip to the movies, homemade pizza for dinner, mommy-son date night where I actually let them order chicken fingers, several hours of video games. Yes, that and more all happened within the span of a few days. My husband was on the other side of the country for nine days. It was cold. And there was a school holiday and a snow day. If the fun of eating seven-layer bacon cheeseburger dip helps me maintain my sanity for a little while, then I’m calling an audible. We are going to break from our usual game plan and having cheesy appetizers for dinner. 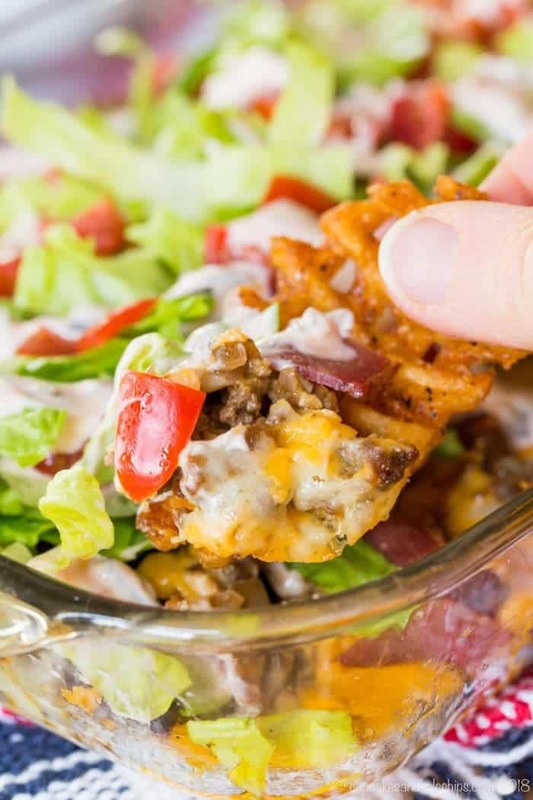 Seven-Layer Bacon Cheeseburger Dip is the ultimate cheesy appetizer for watching the big game! I’ve made everything from Bacon Cheeseburger Crustless Quiche to Bacon Cheeseburger Quinoa Skillet. Clearly, I love taking this comfort food and enjoying it in new and creative ways. This time I took a little inspiration from a famous west coast burger chain and incorporated it into a delicious dip. Start with a base of Cabot Cream Cheese, because that’s how all great layered dips start. Then I caramelize some onions and add a bit of Worcestershire to deepen the flavor a bit. After browning ground beef, stir in ketchup and mustard to give it the flavor of the mustardy coating on those aforementioned fast food burgers. The beef and onions are added on top of the cream cheese along with plenty of Cabot Seriously Sharp Cheddar Cheese. Bake the whole thing until hot and melty. Then it is toppings time. Of course, bacon is a must. But then you can really finish those seven layers with any of your favorite burger toppings. I went with lettuce and tomatoes, much like the traditional seven-layer dip recipe. Plus it was drizzled with burger sauce. I based it on this copycat burger sauce recipe from Dinner, Then Dessert, but I swapped out the mayo for Cabot Greek Yogurt. Feel free to stick with the original recipe if you like. 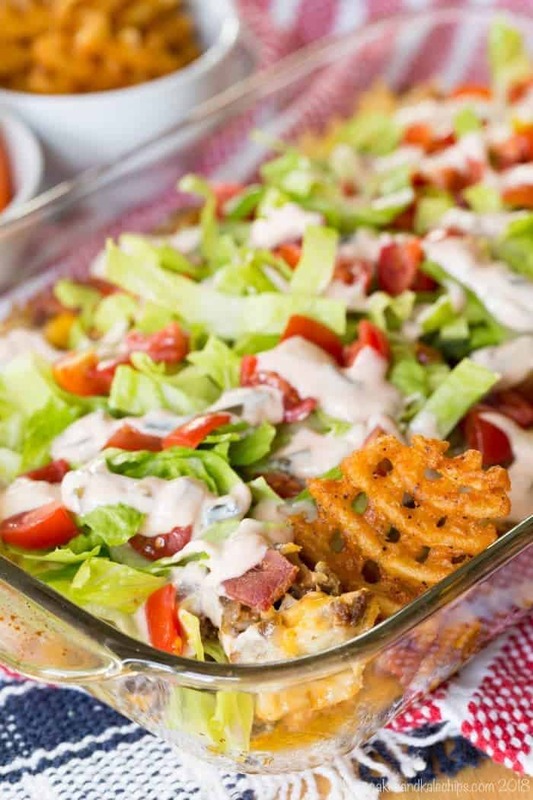 What do you serve with Seven-Layer Bacon Cheeseburger Dip? Of course. you can go for standard dippers, like tortilla chips or crackers. You can even take the low carb route by digging in with mini bell peppers. Personally, I think for the full bacon cheeseburger experience, French fries, particularly waffle fries, work great. 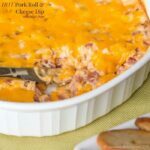 I am beyond thrilled to be partnering with Cabot Creamery Cooperative to share this Seven-Layer Bacon Cheeseburger Dip recipe! From the first time I mentioned Cabot, I think in my Baked Cauli-Tots recipe (which you can actually find in The Cabot Creamery Cookbook), I have never held back my love for their cheese and other products. I’ve been enjoying their cheese, yogurt, and more since I first discovered it while vacationing in Vermont years ago. They truly do make the World’s Best Cheddar. It also happens to be naturally lactose-free and gluten free. I love everything from Seriously Sharp to Horseradish Cheddar. When my little guy was a baby, he wouldn’t touch cheese until he tried the Farmers’ Legacy Collection. And Cabot also has a full line of award-winning dairy products, from cream cheese and Greek yogurt to butter and sour cream, plus whey protein powder, many of which I used in this recipe. But there’s more to Cabot than just the cheese. I love that Cabot is run by the dairy farmers. They are a cooperative, and 100% of the profits go back to the over 1,100 dairy farmers. Cabot is a certified B Corporation because of their attention to environmental and social impacts on stakeholders. And through the Reward Volunteers program, Cabot recognizes and gives awards of cash, trips, and other prizes to people giving back to their communities and logging their volunteer hours. I got to see Cabot’s appreciation of community volunteers in action when I attended two Gratitude Grille events in the Washington, D.C. area. Volunteers from different organizations were served lunch as the farmers’ recognition of the work these people do to make the world a better place. Follow Cabot on Facebook, Twitter, Pinterest, and Instagram for more recipes and information about these initiatives. 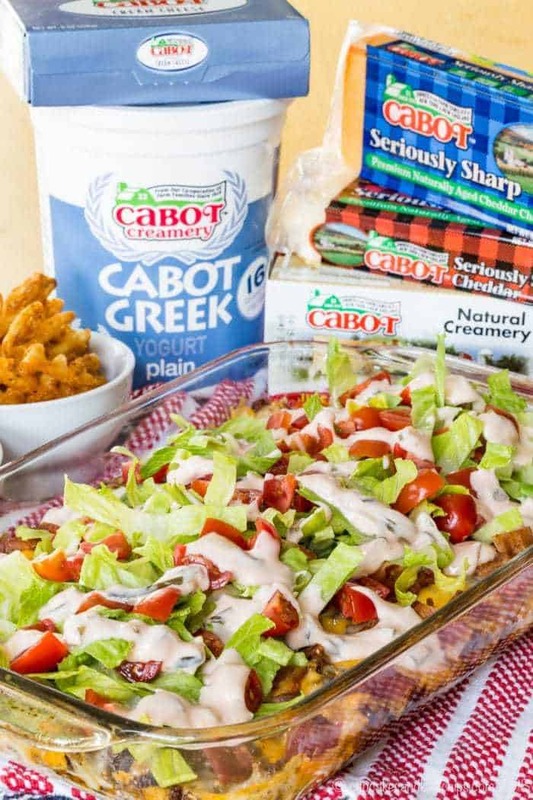 What are more hot cheese dip recipes to make with products from Cabot? And for more than just dips, check out 20 Recipes Featuring Cabot Cheese! My friends also have some amazing hot dip recipes too. For a twist on a favorite, try Artichoke Dip with Kale and Cheddar from Foodness Gracious. Shugary Sweets kicks it up with Hot Jalapeno Corn Dip. And ooey-gooey gets taken to another level with Hot Caramelized Onion and Bacon Dip from All Day I Dream About Food. What do you use to grate cheese? This Kitchen IQ Paddle Cheese Grater is my absolute favorite. The shreds are wide but thin, so they cover the dish and melt easily. Plus it is super sharp, making shredding a breeze. You can shred your cheese right over a salad or quickly shred a perfectly-melting pile for Cheddar Bacon Ranch Roasted Potatoes. 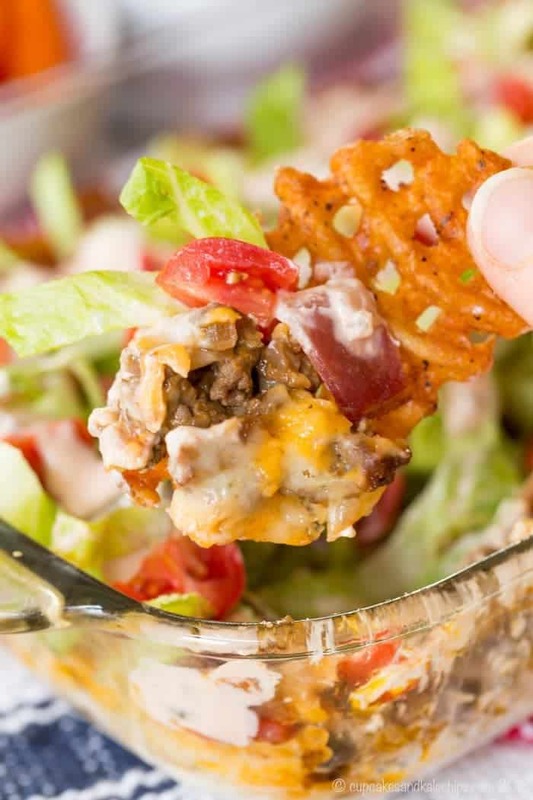 Every layer of this Seven-Layer Bacon Cheeseburger dip just makes it more and more irresistible. See for yourself when you watch this recipe video. 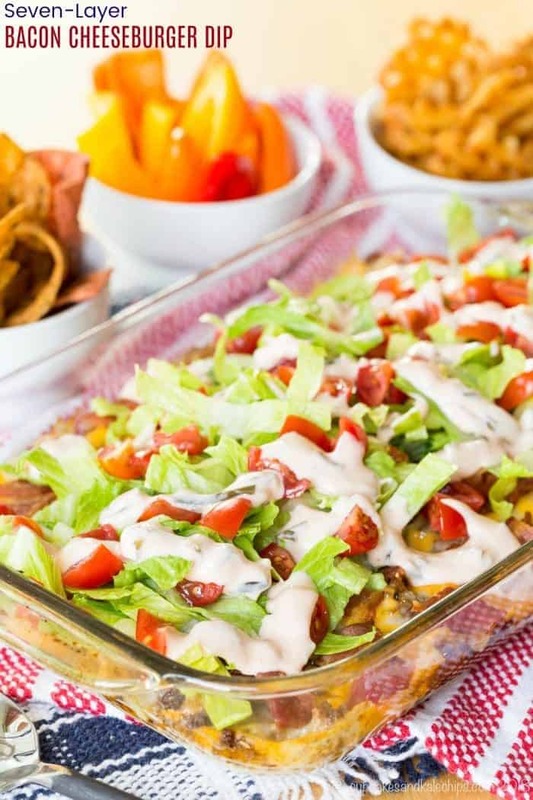 Most seven-layer dip recipes tend to be more Mexican-inspired, but this all-American version started with the same base, a layer of cream cheese. Top that with ground beef flavored with the classic combination of ketchup and mustard and sprinkle with caramelized onions. After adding plenty of cheese, pop it into the oven until it is ooey-gooey and delicious. While it bakes, get your bacon, lettuce, tomatoes, and burger sauce ready so that you can dig into bacon cheeseburger deliciousness in no time. Heat the butter in a small saucepan over medium heat. Add in the onion and Worcestershire sauce. Cook over medium heat until the onions are soft and starting to caramelize, about 5 to 7 minutes. Remove onions and set aside. Add the ground beef, salt, and pepper to the pan and cook until fully browned, breaking it up as it cooks. Drain off any excess grease. Remove from the heat and stir in the ketchup and mustard. Spread cream cheese in an even layer in the bottom of a 2 quart glass baking dish. Top with the beef mixture, caramelized onions, and cheese. Bake at 350°F for 20-25 minutes, or until hot and the cheese it melted. While it is baking, prepare the burger sauce and cook the bacon, if you haven't already. Immediately sprinkle with bacon, and top with lettuce, tomatoes, burger sauce, and any other desired toppings. Serve immediately with chips, fries, vegetables, etc. for dipping. Combine all of the ingredients in a bowl and stir until smooth and uniform. Store any extra in the refrigerator. Burger sauce adapted from Dinner, Then Dessert. step 4 and 5 are the same???? Thanks for bringing that to my attention, Myles. It’s just a duplicate… I’ll get the recipe card fixed. I’m thinking my family would like this for dinner 🙂 YUM!